Today I visited Café Rouge in Chester for breakfast. I have been to Cafe Rouge before but it was a very long time ago in Windsor which was quite a rushed lunch so I don't really remember it, however my dad suggested going for breakfast there and I didn't realise they had a breakfast menu so we decided to give it a go. 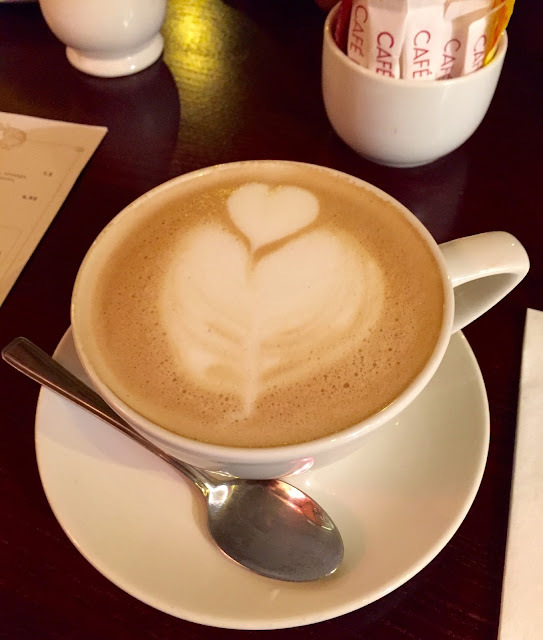 "Situated on Bridge Street, the historic heart of this picturesque city, Café Rouge Chester has a beautiful Parisian-inspired interior, we have the perfect setting in which to meet friends or just unwind over a glass of your favourite." 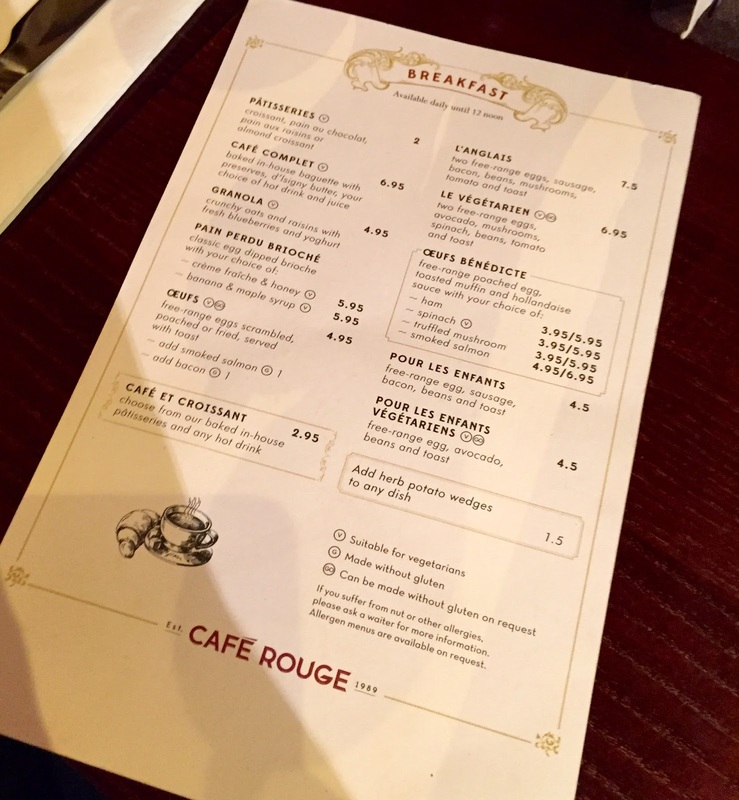 Café Rouge has a very comfortable and relaxed atmosphere, the staff in the Chester restaurant were very attentive and friendly without being too in your face and I felt very at ease in there. The breakfast menu was quite extensive with something to cater for everyone, including my boyfriend Rob, who is a vegetarian. We ordered drinks, browsed the menu for a while and made our choices. The latte (£2.65) we had was delicious (I am quite fussy when it comes to coffee) and my step mum ordered a tea (£2.20) which came in a decent sized pot enough for 2 cups. 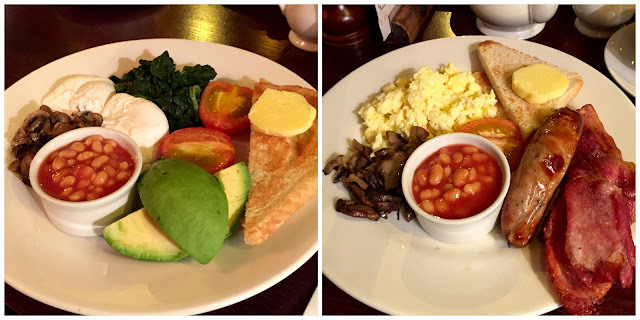 I ordered the L'Anglais breakfast (£7.50) and Rob ordered Le Vegetarien (£6.95) both pictured below. The vegetarian breakfast was different to what Rob usually gets in most places as there was no vegetarian sausage, however the avocado and spinach was a nice, refreshing and healthier change. My breakfast was delicious, the bacon and sausages were of a good quality and there was not a drip of fat in sight, although I do usually like a good hash brown or some form of potatoes, but I left feeling full, without feeling like I had drank a cup of grease afterwards! Each breakfast came with a choice of fried, scrambled or poached egg. The restaurant had a really nice atmosphere so we stayed for another latte and I would definitely go there again for breakfast, which is served until 12pm. Another thing I noticed was that the hand wash and hand lotion in the toilets were from Rituals (the beauty blogger in me was very impressed). If you haven't visited Café Rouge for breakfast I would definitely recommend giving it a go!